Far more than just your grandmother’s favourite necklace, pearls today are regarded as both classic and contemporary. In the words of Jackie Kennedy “pearls are always appropriate”. Often perfectly round in shape, cultured saltwater Akoyas are the classic white pearl, shining bright with a mirror-like lustre and brilliant rich colour. Our most popular pearl is the cultured Tahitian. 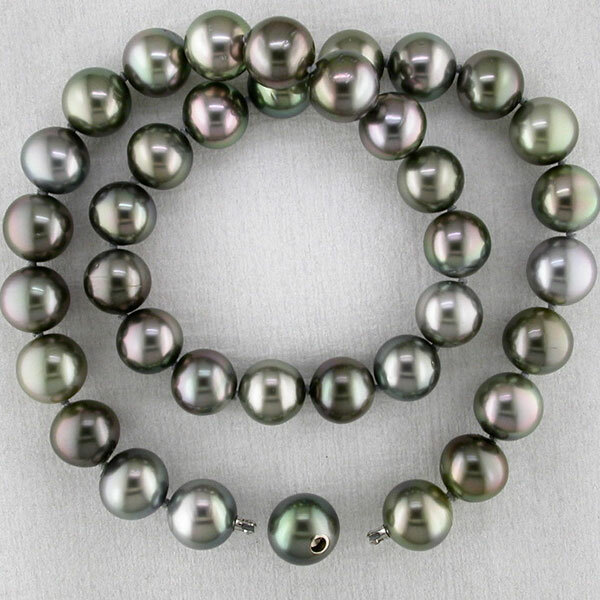 These exotic, naturally coloured dark pearls native to French Polynesia shimmer with gorgeous iridescent overtones. Ranging from baroque to round, cultured Freshwater pearls from China vary in shape and size presenting a rainbow of natural colours. Often the largest and most luxurious, cultured white and golden Southsea pearls feature a gorgeous palette and are simply sought-after. The best thing in the world for preserving the gleam in your pearls is the natural oil in your skin so it’s recommended you wear them as often as possible. Store pieces individually as pearls are relatively soft and can scratch easily. Apply perfume, skin and hair products prior to putting on the jewellery. Keep away from direct heat and liquids. We recommend cleaning and restringing should be under taken every 12-18 months. Please see our Pearl Threading service for more information.